Filquip is a filtration equipment supplier with Vac Truck Replacement Filters readily available off the shelf. Filquip has specialist experience in industrial dust collection, air and fume filtration and liquid filtration. Filquip has extensive stocks of 155mm diameter by 1m long filter cartridges on the shelf and can make any Vac-Truck Filter Bags required for any model. Filquip Vac Truck filters are made from spun bond polyester (240g/m2). We also carry special versions with advanced filter media for hazardous and special applications. Our Filters are generally more robust than the competitors due to our welded mesh metal core (Not Plastic) and advanced head manufacture made from our special rubberised compound (Not Polyurethane) which provides durability, flexibility and effective sealing. 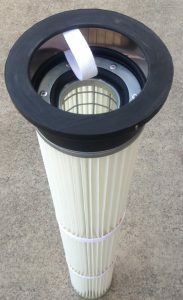 Every filter head comes with a sealing snap band in the top ready for installation into your truck. The flexibility of our filter head compound allows the changing of the size of the sealing snap band to suit the Cell Plate Diameter of your Vac Truck. The filters play a critical role in protecting the blower from damaging foreign materials. Good filters reduce the vacuum pressure required to be generated and results in less energy/fuel being required to operate the Vac Truck. Broken or low efficiency filters can result in the lobes of the blower being eroded adding extra maintenance and unexpected shut down costs.